TWO cholera cases have been confirmed in Bulawayo, both imported from one of the cholera epicentres - Budiriro suburb in Harare. One of the confirmed cases is that of the popular apostolic sect leader who died last week and a city man who was admitted to Thorngrove Infectious Hospital on Saturday. Bishop Enock Mhambare from the Paul Mwazha-led church died at Thorngrove Hospital last Monday after he fell ill on his way back from Botswana. He suffered from stomach aches, watery diarrhoea and was vomiting. Bulawayo City Council Health Services director Dr Edwin Sibanda said only two cases out of 36 suspected cases had tested positive for cholera. "We had an elderly man who was admitted and treated as a cholera patient but the results were not yet out when he died and at burial. The final result confirmed it was cholera," said Dr Sibanda. He said the new case was reported on Saturday. "On Saturday we got another one who tested positive for cholera through the Rapid Diagnostic Test (RDT) .This is a 24-year-old man based here in Bulawayo who had gone to Budiriro in Harare for seven days from September 21 to 28. He was admitted at Thorngrove and was treated for cholera and has responded well. I think he was discharged today (yesterday)," Dr Sibanda said. He said there were two patients at Thorngrove Hospital who are under surveillance. "We have two patients now. The two patients are local but they have a history of travel to Harare. But you must know that if someone presents with a bit of diarrhoea in any of our institutions within the city they are taken to Thorngrove to clear if its cholera or not. In some cases it turns out to be false alarms. The total so far has been 36 that were assessed through the health institution and of those only two have turned out to be positive for cholera," Dr Sibanda said. He said the local authority was prepared for any outbreak with 200 beds. "We have 200 cholera beds in our storerooms so that in the case that we need to set up a cholera treatment centre in Pumula or Cowdray Park, the beds are already there. What is left are the tents and other ancillaries. "We have the cholera beds, brick stands and buckets to go with. So we are doing capacity assessment that in case we have a major outbreak in the city, we can set up centres, so those 200 beds can be deployed," Dr Sibanda said. He said the most advisable thing is that when an outbreak occurs, a centre can be set up other than sending everyone to Thorngrove. The Ministry of Health and Child Care has said there has been no increase in the deaths from cholera in the last six days, with the death toll remaining at 49 recorded on Wednesday last week, a sign that the disease is being contained and is no longer a big threat. 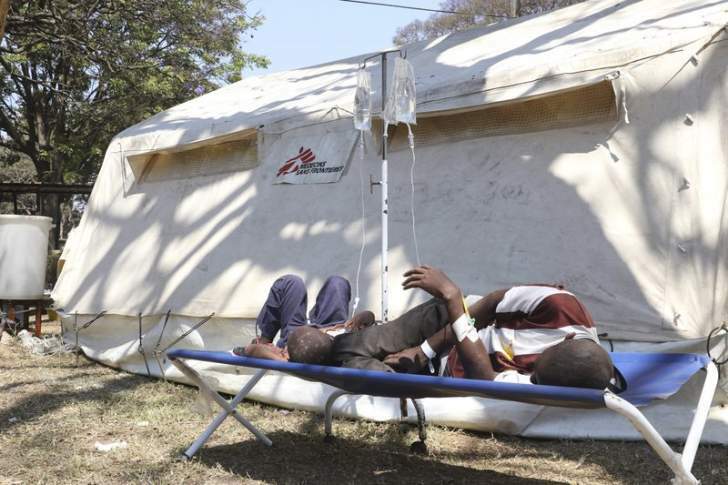 Meanwhile, health officials in Matabeleland South have treated three cholera cases that were reported in Beitbridge and also activated the epidemic disaster response plans in all the province's districts, an official has said. The Provincial Medical Director, Dr Chipo Chikodzore, said they had mobilised enough resources including medication to deal with further outbreaks. "Cholera is a preventable disease that is used as a barometer of inadequate access to safe clean water and sanitation," she said. Speaking during provincial commemorations of the World Habitat day at Dulivhadzimo Stadium yesterday, Dr Chikodzore said Beitbridge has the lowest rate of access to safe and water and sanitation facilities and the risky situation is worsened by the high movement of traffic in the area. She said there was a need to revamp ageing water and sanitation infrastructure at most health institutions in the province, especially at Beitbridge, Gwanda and Maphisa hospitals.